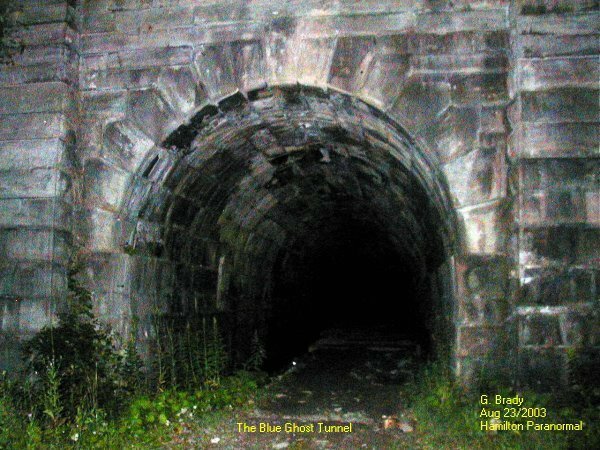 We went out to the BGT once more with a couple of new friends to investigate the tunnel again. Cathy, Myself, Brian and Chad. When we had got there Chad stepped into the tunnel and felt something really weird within the tunnel. He came running back and said he had felt a strong presence. 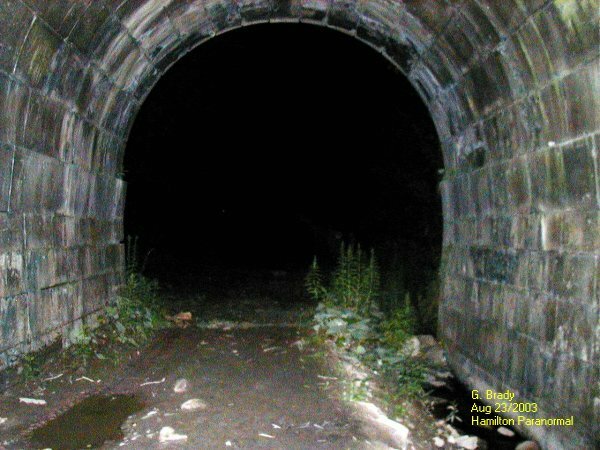 The area around the tunnel had a creepy feeling to it this night. Also there was something else that struck me as being odd. The gates that lead to the tunnel were open. We had arrived at the tunnel very late and for the gates to be open was very unusual. 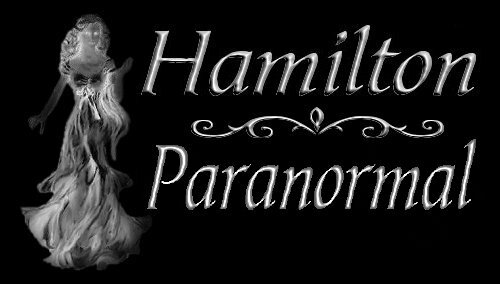 I did pull the hearse up to the mound and parked within the gate area, hoping we did not come back to find we had been locked in. I was sure that we would all get a lot from the tunnel this night but we only got a few pictures of interest out of 62 pictures taken. We started out as a group to enter the tunnel. The boards that lead in were very slick with a slimey mud and some of the boards on the walkway in the tunnel felt very soft. Some were popping up when we stepped on them more than the last time we were there. There was a sense that we were all being watched by unseen forces. We were also being watched by bats that stalk the tunnel for we had come across a few of them. 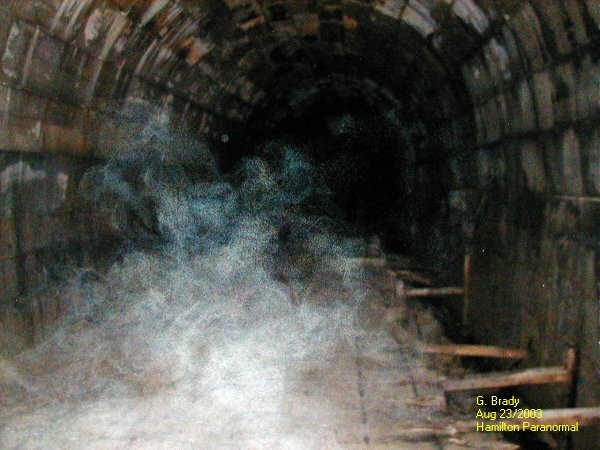 Once we had reached the beams of the tunnel I bent down and went under the beam and then I had an urge to take a picture looking back to the tunnels entrance and caught some ecto mist forming by me on the left hand side of the tunnel. After taking many more pictures and talking about the bats that joined us, my camera batteries went dead. They were newly recharged batteries?! I loaded the camera with the spare set and then the flashlight went dead. The others were deeper into the tunnel investigating the area. I could feel a strong presence just in front of me and I took this photo of some ecto mist that had a lot of energy to it. I took a few more pictures and then I started to head back to the tunnels entrance using the light from my camera's LED screen to light the way back across the boardwalk. I had to move very slowly along the boards taking pictures about every 3ft so I would not slip on the mud. 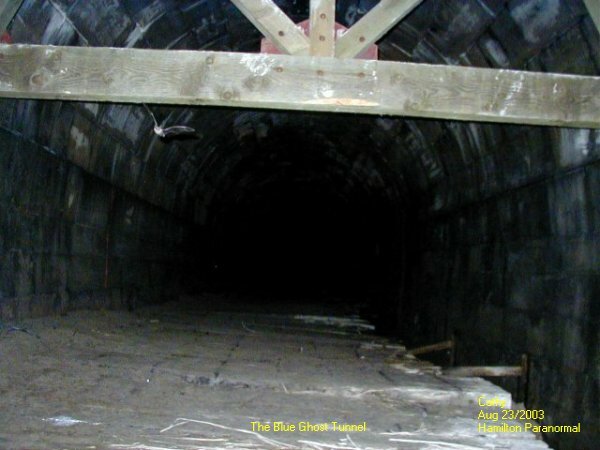 Nothing paranormal in this picture, but I thought I would share this photo with others of the entrance of the tunnel looking out from within the tunnel. While in the tunnel near the entrance you could see movement just outside the tunnel and hear low voices that were near by. Again nothing paranormal in this picture. Just a shot from outside the tunnel while I waited for everyone else to come out and join me. It seems I wasn't the only one with battery problems. 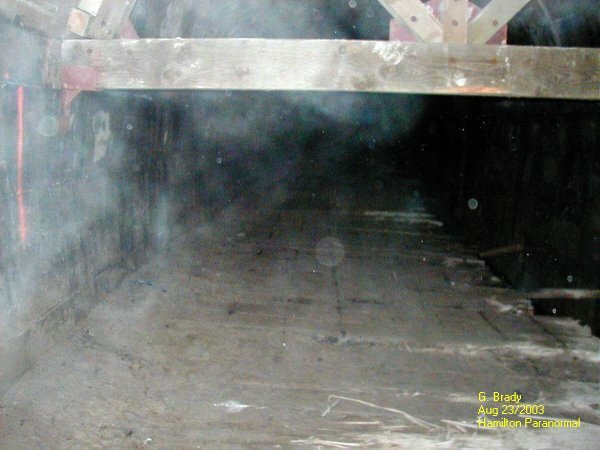 Cathy said her batteries failed while inside the tunnel too.